i read the wisdom of the ages, others exploring the dark night of the soul and their words scatter like sand across the pages, never taking root in my unsettled soul. the dark, beating hours of the soul. luring me to sink into depths of consent. i drop down into a tub of hot water and soak in the darkness. she, on one end of the line, in her own self absorbed confusion, not so different than pre-stroke, unable to be present to anyone but her own discontent and the lifelong relationship of pain and demands and unmet expectations. the other end of the line brings the known, expected and tender words. and, he has always been gone. i sat in the darkened sunroom, alone. i cannot sleep. i wander room to room, inside to outside, moving from one bed to another, staring out blackened windows, listening for sounds of life. i turn on the television and am met with the carnage and death, streets filled with fallen bodies. have I felt too much? is it possible that i am devoid of emotion or caring or compassion? will his death finally set me free? In. Out. Breathe in, breathe out, breathe with, follow those thoughts, meandering and moving with each breath. It was only one week ago. I woke in the early, early hours of Sunday morning. I lay in bed, listening to the darkness, searching for the neon red numbers to mark the time. Waiting for the light to shift, for dawn to break, for the day to begin and the night to end. Hours passed. Thoughts muddled through my mind. No answers, no purpose, no reason. Just wakefulness and uneasiness. So I breathe, waiting. I breathe and let go. At first light, I left a note on the counter, packed a bag, and began the drive over the mountain, headed to my father. The father who told me not to come. The father that had disowned me. To the father that abandoned and coerced, that manipulated and taught me that girls don’t matter, girls are good for only one thing, girls never amount to much. The father that never acknowledged birthdays or Christmas or graduations. My body is imprinted and remembers the thump of his forefinger on my chest, my being knows the submissive crumple to the floor, my heart has no tears, no longing, no hope. And yet, with each breath I take, I follow. I go. I remember years of teaching and preaching, endless words, thoughts and theology that centered around the concept that a personal view of God was reflective of your relationship with your father and this all hinges on an assumption that God is male. For some reason, with a measure of grace and a bit of luck, I have not struggled with the image of God. If I had based my understanding of a higher power on my father, I would not have held any faith of any kind in any God other than a tyrant. Those three early morning hours took me over the mountain and into the desert, an appropriate metaphor for the journey I was on. No music, no words, no anxiety, no fear. Only the gentle wind, the intense beauty of brilliant blue sky, and the awareness of my breath, leading me, inviting me to follow. Inviting me to be alive, inviting me to be intentionally present and aware. 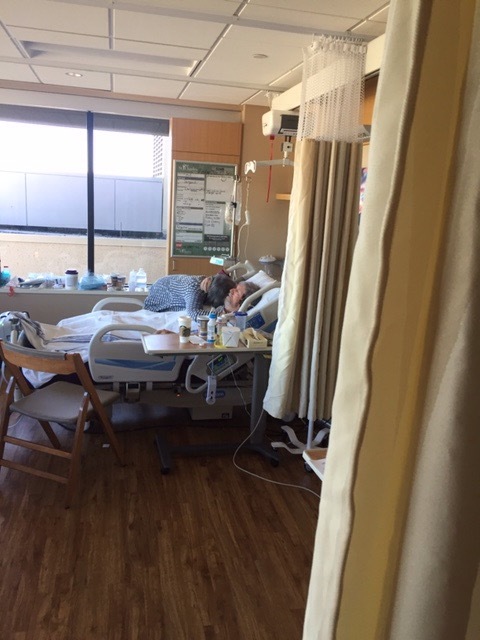 I sat at his bedside, barely recognizing this man, the one called father. His breath was shallow, he felt hollow and empty. I began to breathe with him. His eyes opened and he looked past me, towards the ceiling, off into the distance. When he focused on me he let out a small moan and said, “Oh, you look so pretty.” I pulled the chair closer. The image of God was in that moment. No accusations, no need to be right, no need for forgiveness or absolution or justification. The image of God, the face of God, was in the pain, in the reality of death and dying. That moment can only be grace. Nothing forced or held onto, nothing demanded or required, simply present. Today I am at the coast, breathing salt air, walking the edge of the Pacific Ocean. He was discharged home with hospice. He is no longer responsive. No food. No water. He is preparing to let go for maybe the first time in his life. He just might be closer to knowing the true face of God than I have ever have imagined. Last night I woke in the darkness again, to the sound of the river and the blackness. I thought of my father, also alone in a different kind of darkness and offered a prayer of gratitude. I will continue to intentionally breathe with him, over the miles, even at a distance, as he slowly leaves this life. In. Out. Breathe in. Breathe out. His last breath is yet to come.